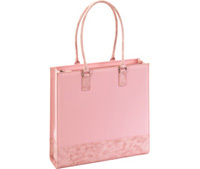 Targus Radiance Tote is sleek notebook bag for ladies with feminine look and feel. Targus Radiance Tote laptop bag can fit notebook computers with screen sizes up to 15-inches and available in vibrant colors i.e. Pink Petal, Sage, and Chocolate Brown. The tote bag is constructed of durable microfiber, and features hardware accents to prevent wear and tear on the handles and a padded notebook section for extra protection. Inside, there is an internal zippered side pocket, pen/pencil loops, a business card/ID holder and additional card slots, a compartment for a PDA or MP3 player and a removable zippered pouch for personal items. NotebookReview reviewed Targus Radiance Tote laptop bag for ladies and concluded that the Targus Radiance tote is a trendy tote bag for ladies. It offers good storage space for paper, pencils, books, make-up, and of course laptops of up to 15 inches in screen size! One of the major selling points is that this bag is very affordable, it costs $39.99,which is really not too bad. Additionally, a portion of the purchase will go to support the fight against breast cancer, so you can feel extra good about buying this bag.